United South End Settlements (USES) opened its doors in 1892 as the Andover House, the first settlement house in Boston. The 1890s saw incredible change in the South End and in Boston. Emancipated slaves, new European and Asian immigrants, and rural laborers flocked to big cities in search of work, freedom, and opportunities. Many found poverty, bad housing, and fierce prejudice. To address these problems, a new form of engagement emerged: the Settlement House. The founding principle of these organizations was to provide college-aged, upper-class men and women with opportunities to live in impoverished neighborhoods and partner with residents in order to lift their neighbors out of poverty by strengthening families and building community. Historically one of the poorest neighborhoods in Boston, the South End deteriorated rapidly after World War II due to “redlining” and urban renewal. Despite its poverty, the South End was a wonderful place to live. Children who grew up during this time fondly remember the corner stores, their neighbors, and the great sense of community in this uniquely multi-racial neighborhood. Post-World War II, the Settlement Houses addressed their community’s increasing distress and decreasing resources by consolidating five houses into one, United South End Settlements, in 1959. 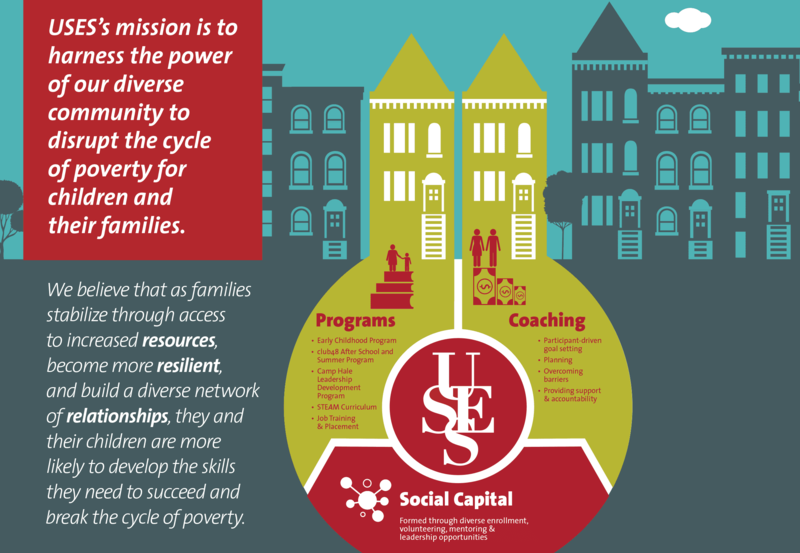 As United South End Settlements celebrates its 125th year and beyond, we are now reaffirming our founding vision of an inclusive community where neighbors from all walks of life work together so that all can thrive, while implementing a bold, new model designed to promote economic mobility and social capital to break the generational cycle of poverty.